[Colonel Sir Anthony Coningham Sterling of the Highland Brigade, Scottish soldier and military historian.] First four pages of Autograph Letter to 'Maclean', describing his efforts to obtain a commission for Maclean's 'Young friend'. 3 South Place, Knightsbridge. 1 November 1856. 4pp, 12mo. Bifolium. In good condition, lightly aged. Evidently incomplete: the first part only of a long letter. Begins: 'My dear Maclean | I have it not in my heart to put forward an excuse for very long silence, beyond an amount of employment the like of which I have never had thrown upon me before, for many years.' He hopes to see him, but leaves that night 'for the North on a tour of inspection'. [ George Sterling Ansel Ryerson, Canadian politician and physician. ] Autograph Letter Signed ('G Sterling Ryerson') to the Secretary, Royal Society of Arts, regarding his subscription arrears, describing his recent misfortunes. With calling card. The letter on his letterhead of Peaceacres, Niagara-on-the-Lake, Ontario [ Canada ], with monogram 'ETR'. 1 October 1924. LETTER: 3pp., 8vo. Bifolium with mourning border. In good condition, with the Society's stamps and annotations. He apologises for being 'behind in my annual dues', explaining that he has 'suffered severely from the war, financially & personally - my wife went down in the Lusitania - and have had my means seriously reduced'. Nevertheless he would like to renew his subscription and would like to know 'on what terms I can rejoin the Society'. Docketed in pencil and ink on reverse of second leaf: 'Elected June 1911 | Paid 2 years | taken off Dec 1916' and '2.2 for arears £5.5 up to Xmas 1925'. [ 'Baron', London photographer. ] Twenty-four black and white photographs of his head printer and retoucher Mary Buchanan Owen, with an Autograph Reference by him, signed 'Baron & W Nahum', and genealogical notes by Owen's great-niece Kay Locker. The reference on the letterhead of 'Baron | Camera Studies. 23 Grosvenor Street W.1. Mayfair 5069 [ London ]'. 2 August 1940. Some of the photographs are dated, between 1936 and 1947. The collection of 26 items is in fair condition, aged and lightly worn. The 24 black and white photographic prints, of which there are 23 different images and one image duplicated in a smaller size, range in size from 29 x 24.5 cm to 8.5 x 11.5 cm. The pictures are tender and affectionate, in an informal style unusual for Baron. One picture, stamped 'UNRETOUCHED ROUGH PR<...>', shows Owen sitting on Baron's knee, on a wooden bench, the two smiling. The four largest are studies of Owen's smiling face, staring into the camera. [ 'Baron', society photographer. ] Three family photographs of 'Baron' [ Sterling Henry Nahum ], one with a signed inscripion by him, and a contact sheet of nine shots of his face. The inscription on the back of the photograph is dated May 1940. The other items undated. Three black and white prints, ranging in size from 12 x 17 cm to 10 x 7.5 cm. The contact sheet is 12.5 x 13 cm. The four items in fair condition, lightly aged and worn. One of the three pictures shows a smiling Baron outdoors with a young blonde boy (his son? ), who is holding a camera tripd; another shows him standing with his arm on the shoulder of another man (his brother? ), both on skis in the snow; and the third shows him in a heavy wool coat, on the steps of a European building, with a man in Slavic costume. The last is inscribed on the reverse: 'May 1940 | <?>. [The School of Architecture, Pratt Institute, Brooklyn.] Striking printed poster/magazine: 'NUMBER 1. | Periodical for the communication of ideas and opinions between students and teachers The School of Architecture Pratt Institute Brooklyn'. The School of Architecture, Pratt Institute, Brooklyn. Spring 1971. Presumably all published. An excessively scarce item, with no copy traced, and none listed on OCLC WorldCat or COPAC. Printed in black on one side of a piece of thick white 85 x 55 cm paper. A display item, in fair condition, lightly aged and worn, with three small closed tears at crease ponts, and one dog-eared corner with slight loss to margin edge below. Striking modernist design, with architectural plans, photographic illustrations, and central collage of architectural features, and two columns of sans serif text, with headings in 'cargo crate' font. Manuscript 'Report on the Road from Frimley to Yorktown [Surrey, England]' 'Ewart' [Sir John Spencer Ewart, while a Sandhurst cadet], with coloured manuscript map and four other field sketches by him; with sketches by 'Sterling' and 'Gordon'. Report on War Office 'Form 33'. Ewart's four additional sketches dated 1880 and 1881, the other material undated. The collection, deriving from the Ewart family papers, is in good condition, on aged paper, with fraying to the extremities of the report. Sir John Spencer Ewart, son of General Sir John Alexander Ewart, Colonel of the Argyll and Sutherland Highlanders, entered Sandhurst in 1880, and left the following year, with the sword of honour, to join the Queen's Own Cameron Highlanders. (For more information about Ewart and his father, who also obtained 'special distinction' at Sandhurst, see their entries in the Oxford DNB.) ONE. Manuscript 'Report'. 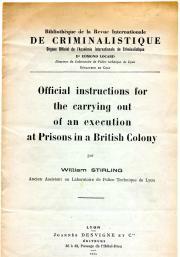 Official instructions for the carrying out of an execution at Prisons in a British Colony. 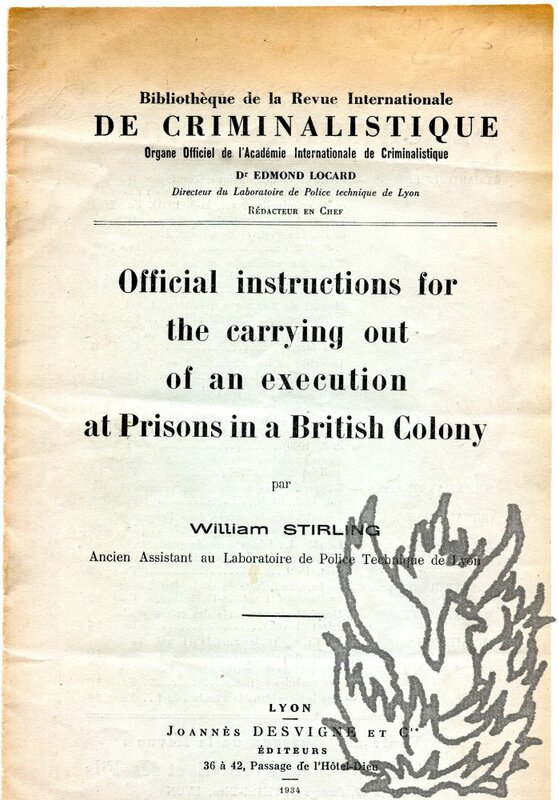 [Offprint from the 'Revue Internationale de Criminalistique', vol.6 (1934).] Lyon: Joannes Desvigne et Cie, Editeurs, 36 a 42 Passage de l'Hotel-Dieu. 1934. 8vo: 4 pp (paginated 3-6). In original light-green printed wraps. Text in English, clear and complete. Good, on aged paper, with slight discoloration to wraps. Blind accession stamp of the British crime writer Jonathan Goodman (1931-2008). The following sentence is deleted in pencil: 'The above instructions have been observed at executions interessed [sic] by one.' A 'plan of the authorized scaffold' is said to be 'attached', but is not present. No copy recorded on COPAC or WorldCat.